Whether you’re celebrating a special occasion or hosting a get-together “just because,” a brunch party is the perfect way to change things up a bit. There is no better way to start the day than surrounded by your favorite people, eating all sorts of breakfast food and having a mimosa or two. Brunch parties are often avoided, because many think it means waking up before dawn and being ready for a nap by the time the guests arrive. 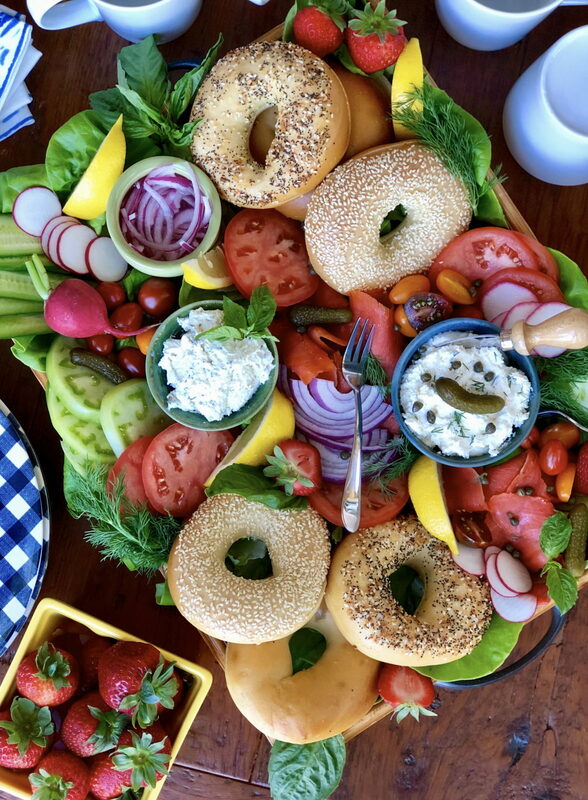 That’s simply not the case when you create a DIY option like this beautiful bagel tray. 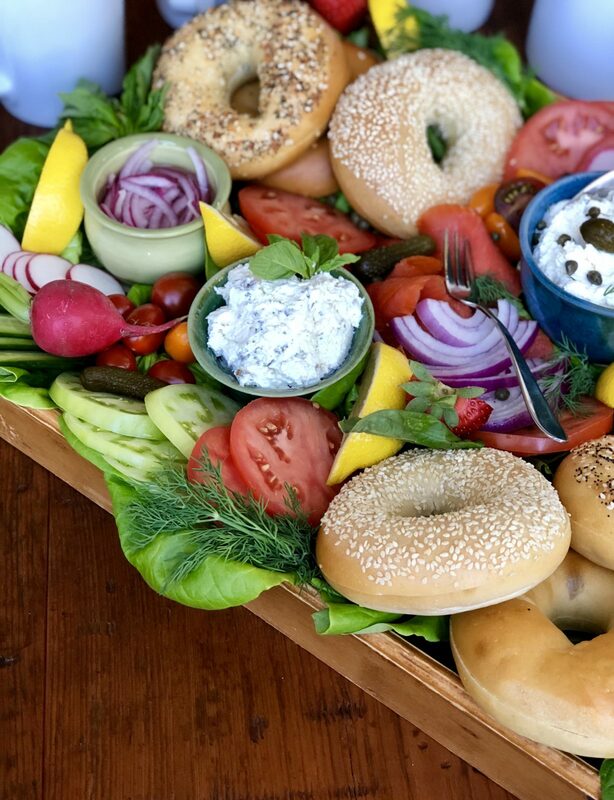 An assortment of bagels, and all the fixings create a gorgeous spread for your guests to enjoy. If cooking is not your jam, fear not… because you can buy everything on this tray! Yes, everything. The morning of the party I will purchase the bagels and I always go with a variety of different bagels, the seeded ones are my favorite because they have much more flavor (and they’re pretty). Everything else can be purchased the day or two before. Smoked salmon, cream cheese, and all sorts of fresh produce will be totally fine the following day. Speaking of produce, I really just buy whatever looks good and what’s in season. Fresh and colorful tomatoes, red onion, herbs, miniature cucumbers – the more color, the better! Most importantly, have fun creating the board, there is no right or wrong way to arrange it. On another note, can we talk about photography boards for a moment? I’ve always had a hard time finding the “perfect” board. I’ve always wanted one that actually looked like a table, not just a bunch of boards nailed together. About a month ago, I came across this company called The Hand Made Table. Just like the name says, they specialize in tables. However, they recently just started making photography boards for people like myself. They use wood dating back to the 1700s and 1800s and let’s just say it’s pretty spectacular. Most of the wood they use is from the Civil war and earlier, so that it is all hand-cut and planed. Another reason why I love these boards is because they are sealed with food safe poly, which is also water resistant (great for shooting beverages or any other messy shots)! This is definitely a great feature, so you don’t ruin your beautiful board when taking photos. Check out their website at www.ourhandmadetable.com or on their Etsy page, the team makes beautiful pieces of art. Use a large board or serving tray. Top with bagels and desired toppings. The more the merrier, in my opinion.